Article published in l’Express (January 30 2016). 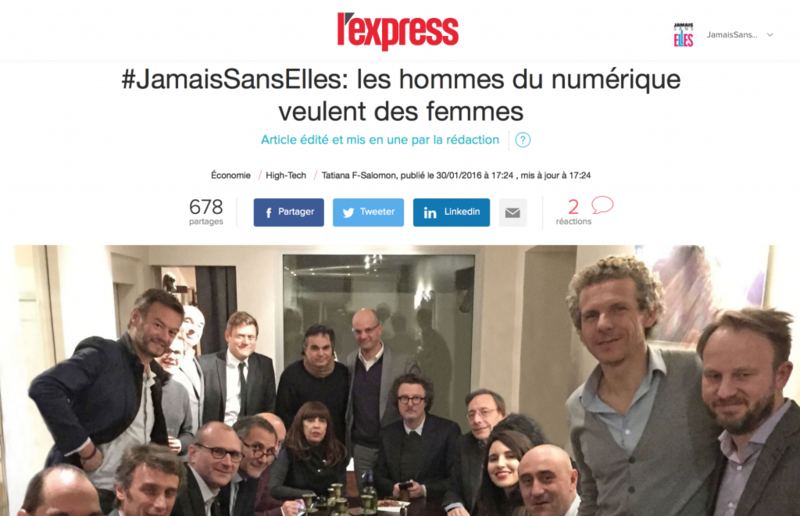 They are players or bosses in the digital world who have come together so they never have to attend a symposium or meeting with only men: this ’Club des gentlemen’ (Gentlemen’s club) made an invitation, welcomed by contributing writer Tatiana F. Salomon, which she has passed on to us. Never without her or rather #JamaisSansElles (“Never Without Her”) ! The hashtag of the week that went viral with a driving force that surprised both men and women. It became a trending topic as soon as it was launched on January 23 2016, having been viewed possibly by more than 3 million people over the past 7 days (the article was published January 30 2016, as of today the number has increased to more than 90 million). A three word invitation, simple and to the point, made directly and with conviction by the members of the Club des gentlemen we founded in 2014 with Guy Mamou-Mani, alongside entrepreneurs and leading figures from the digital world committed to public debate and the humanistic transformation of society. An invitation, made individually, to no longer participate in public events, debates, expert panels or round tables at which no woman is present. As soon as the invitation was launched it benefitted from staunch support and representation on social media where numerous leading male figures rapidly let it be known that they also wished to join ranks with the first signatories and commit to exercising proper vigilance in this regard. In a blog post about this dynamic, where organized support from men for women is most welcome, the blog Programme Eve poses a very relevant question : How is it that when women activists express themselves on this topic, they are not heard, whereas the same message delivered by men seems to hit the nail on the head? Isn’t this, ironically, the best illustration that truly only a man’s word matters in this world? Perhaps. Still, as regards the transformation of society the best strategy is always one of pragmatism. I’ve never been big on confrontation: unity is our strength, not what opposes or divides us. We do indeed live in a male dominated world but it isn’t necessarily by fighting one another that we will re-establish balance. Coming together is the best strategy to my mind. And the most natural. If the goal to strive for is a world where we will be able to work together to enrich ourselves mutually and bring our respective strengths and similarities to bear, why not start now, as well as in the fight to change the rules of the game? The success of the #JamaisSansElles invitation cannot be put down solely to the influence of the men who launched it, but rather because it is not perceived as a feminine assertion. Actually, it has nothing to do with transaction or concession in a power struggle or balance of power. It is not a response to a greater demand for influence made by women. Some might think it regrettable. Unlike them I find it most delightful. I’ve always found it terribly bothersome indeed humiliating to see women putting themselves in a position of quasi subordination to demand or even beg for recognition and visibility; which should neither be a blessing or favor, but rather the simple recognition of a wholly legitimate demand. It seems to me that if the signatories of the #JamaisSansElles invitation are committing to boycott panels that are exclusively masculine, it is not so much to assure a certain balance in the power of debate, communication, and decision-making; it is simply a question of common sense. They are of the opinion – they know – based on hard won experience that symposiums, events, and round tables that are 100% men only are profoundly flawed, incomplete, that an absence of diversity leads inevitably to a lack of relevance. In our conversations with the male initiators of the invitation, such as Guy Mamou-Mani, Henri Verdier, Gilles Babinet, Étienne Parizot and Jean-Michel Blanquer, Natacha Quester-Séméon and myself were pleased to observe that they had not taken the slightest feminist posture, had not adopted any pseudo moral discourse; there was no trace of condescension behind the movement. These men have made their commitment, they say, simply because of how absurd it seems to them to participate in public events, with social, political, and economic stakes, etc., where there are only men. And, it is not only to women they are saying this but to all those who perpetuate exclusionary practices—unconsciously at times by the way, which is almost worse—and who persist in not seeing the absurdity that others have seen already (or, at last ;-)). This is why I am pleased with the response the invitation elicited, the knock-on effect it has had in political spheres and the broad mobilization that goes hand-in-hand. To be honest I am not overly surprised. I sincerely believe it is but the visible part of a tidal wave that is moving through society, which in fact has other parts, such as with the movement Bleu Blanc Zèbre created by Alexandre Jardin, whose extraordinary work is a source of hope and inspiration for many; or more recently Claude Posternak and Xavier Alberti’s La Transition movement. All three (is it pure chance?) are signatories of the #JamaisSansElles invitation, as well as members of the Club des gentlemen. This powerful multidimensional emergence is excellent news that will no doubt surprise all those who are unaware that the codes are changing. They have already changed! The reason I founded Girl Power 3.0 with Natacha Quester-Séméon in 2006 is precisely because we had observed the absence of women in the digital world and the social paradigm that ensues from it; when indeed this new paradigm is by nature closer to those values generally associated with the female principle, which places more emphasis on collaboration than it does on competition, for example. It is clear that women have made an enormous contribution in this area and their increasing investment will be precious in implementing new approaches and creating new stakes. Once again it is no accident that the godfather of the association is none other than Benoît Thieulin, the president of the Conseil national du numérique (French Digital Council), a signatory of the invitation and member of the Club des gentlemen. It is of course the absurdity of the exclusion of women that is the major driving force behind the movement; the fact that it is beginning to be obvious to men is the sign of a positive development heralding hopefully a new phase in the building of a more just and better balanced society. As very much a product of the counterculture myself, I have always thought that it is together that we would find the solutions to the challenges related to the transformation of the world. PS : The most recent example of the best wishes from the French government to French Tech clearly show that the battle is far from won. However, it is not surprising—alas!—that the political world lags so far behind in this area. Let us keep our eyes fixed on the society that is moving forward through the personal stances and citizen involvement of all those who are a world ahead. And let’s encourage them! The list of the signatories of #JamaisSansElles – #NeverWithoutHer can be found here. 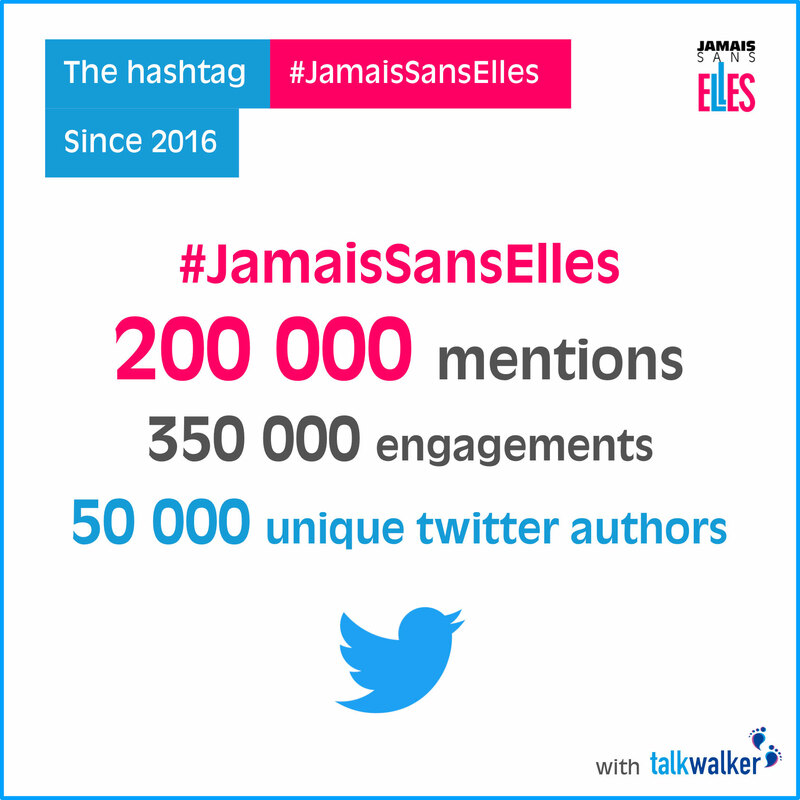 Pledge #JamaisSansElles (“Never Without Her”) : 160 VIPs (from tech industry, media, politics, education) and French diplomatic corps commit themselves!